As part of branding project for PVD Doula, I illustrated this fun postcard that will be sent as a little celebratory note from the doula to her past clients on their baby's birthday. The stork in the illustration is a reference to the stork in PVD Doula's logo. 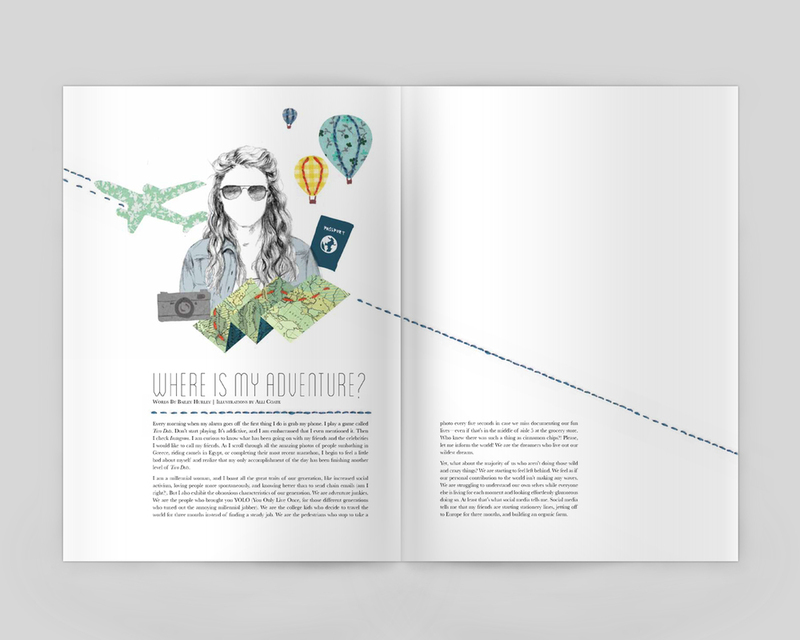 Here's some recent illustration work for Deeply Rooted Magazine to accompany an article called, "Where's My Adventure?" The piece was about comparing our often mundane lives with the glamorous, exciting portrayals of other people's adventures that we see through social media. The writer shared about the good that God can do in the mundane parts of life, and finding adventure in the everyday. Creative Director Meghan Caughill requested a collage-style illustration featuring faceless portraits and little details to portray the lives of different women. I loved the concept and chose to combine my three favorite techniques to create these images: pencil drawing, fabric collage, and stitching. Meghan also incorporated some of my stitched lines into the final layout (see below). I really enjoyed working on this project - thank you to the Deeply Rooted team for including me in this issue! This week I finished up this piece for REN - they ended up going with a different colorway but this was my favorite. Hope you enjoy! Here are a few drawings from the brainstorming stage of a project I collaborated on with talented designer Chris Leson. We were exploring the idea of combining a rustic, hand-drawn feel with clean typography to create the identity for Branch Brewing. Although these drawings didn't make the cut for the final product, I'm happy for any excuse to spend some time in my sketchbook! 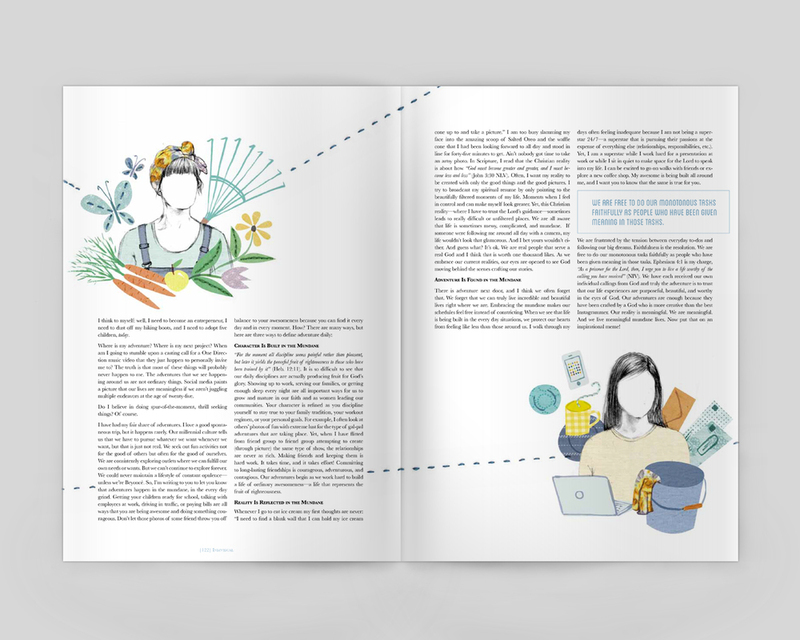 I recently had the pleasure of illustrating a piece for Issue 8 of Deeply Rooted Magazine. The story was about shaping the "heart of the home" – lovingly caring for the relationships your home holds – versus being consumed with the small details of day-to-day life. I chose soft colors and comforting "homey" textures to pair with delicate drawing to communicate this emotional/abstract concept. Many thanks to the Deeply Rooted team for including me in the issue, it's truly an honor to be a part of this beautiful and meaningful magazine. "Within Her" prints in the shop! This print features hand-lettering of Psalm 46:5 ("God is within her, she will not fail.") and simple floral illustrations. The mint green background with a subtle texture is anchored by a flourish of colorful leaves and flowers. This print looks stunning in a white frame with a white mat, especially against a wall painted in a coordinating color. p.s. This design is also available as a pillow cover! Just added a brand-new art print to the shop! The "Full of Joy" print is available in two sizes- 8"x10" and 5"x7". This print features hand-lettering of Philippians 4:4 ("Always be full of joy in the Lord. I say it again – rejoice!") and simple floral illustrations. The deep green background with a very subtle texture puts all the emphasis on the pale peach lettering. This print looks stunning in a white frame with a white mat, especially against a wall painted in a coordinating color. I originally created this print along with two others as decoration for my niece's nursery – this art would fit just as beautifully in any room of your home as well. Hope you enjoy! More prints coming soon. The trees had been bare for too long this winter - finally, leaves!! I had the pleasure of creating the branding for PeaceLove's second annual Peace of Mind Speaker Series. The one-day storytelling event is all about sharing stories of creativity and mental health in an inviting and positive atmosphere. I used simple speech bubble shapes in an overlapping pattern to emphasize community & communication, and chose a color palette and textures that would tie in PeaceLove's artistic branding. Plan International works in developing countries to end the cycle of poverty for children, developing solutions to ensure long-term sustainability. Their holiday "Give Differently" catalog offers opportunities to donate actual items needed by the communities where they work. For the 2013 Holiday Gift Catalog, I illustrated the items that can be donated over photos from developing countries, showing both the need and the outcome. "We had a fantastic experience using Alli as our illustrator for our Holiday Gifts of Hope campaign. Alli was reliable, flexible, and produced high-quality work that was far better than we had anticipated. Her personable nature made her a joy to work with. We’re looking forward to partnering with her again in future campaigns!"